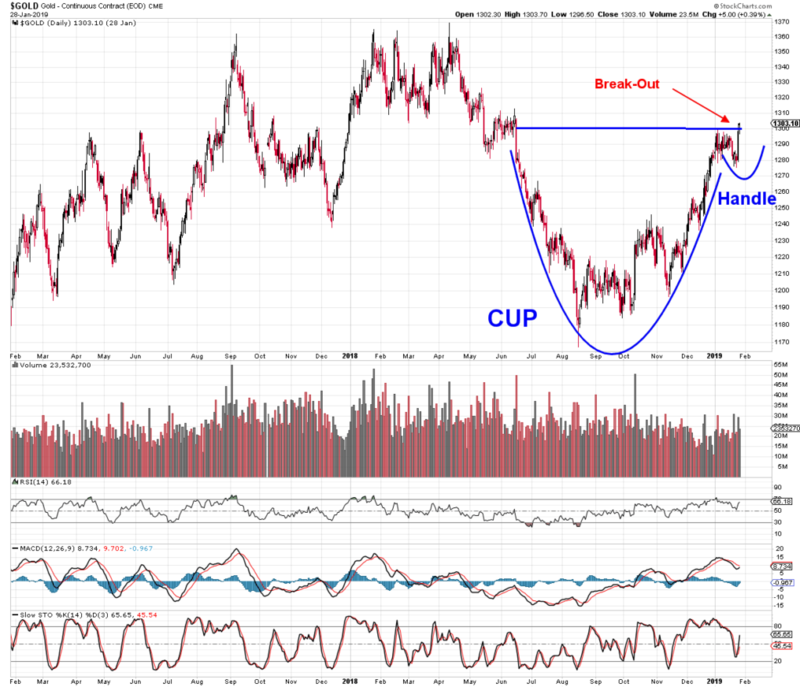 There is a known relationship between two strongly watched commodities – Gold and Oil. The theory behind suggests that rise in oil price partly accounts for rise in inflation. Higher oil prices lift a cost of transportation which results in higher prices of goods. Fact is that this part is perhaps significant and if not, the financial market perceives it as significant even though it may be overestimated. Both oil and gold have an inflationary relationship and thus, increase in oil generally means the increase in gold. (There is a more precise aspect of real inflation that is discussed below.) At the moment we are looking at the historical relationship between gold and oil. As you can see on a chart below, the prices of both commodities move alongside each other with some exceptions that were usually caused by certain shocks (e.g. stock market correction). To prove a positive correlation between oil and gold, you can perform a statistical measure “R-squared” – a result shows how much changes in one price can be explained by the other price. The R-squared of last 20 years is around 80%, which suggests that prices of gold and crude oil are significantly related. 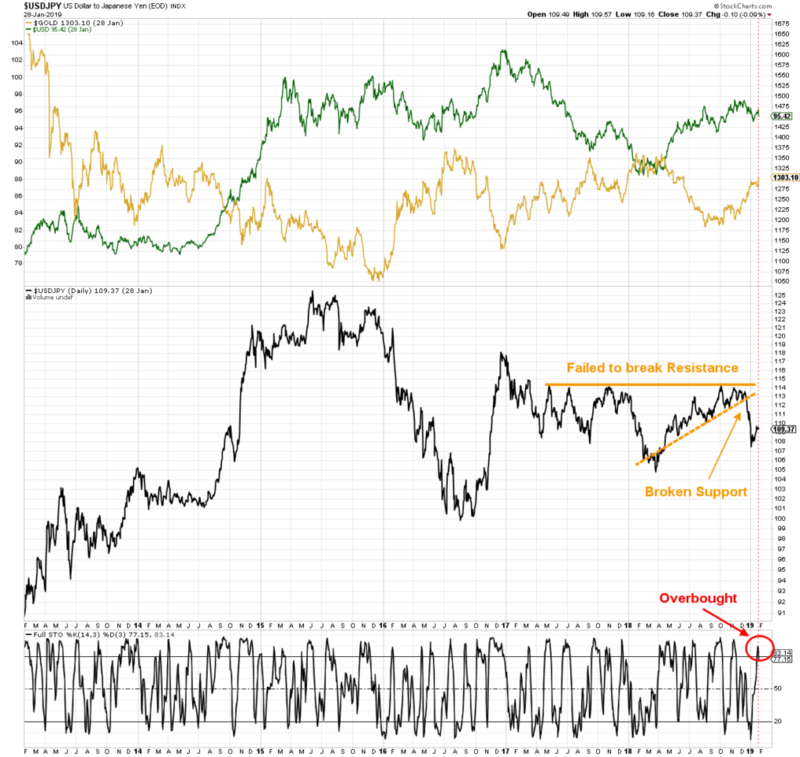 The most recent break-up of these two commodities’ relationship happened in April 2018, when gold failed to pierce its resistance of 1360-1370. There were several attempts to break this level since July 2016. Furthermore, a never ending bullish euphoria in the overall stock market simply did not allow the gold bulls to go up and forced them to give up. This resulted in a sharp gold price decline. In contrast the crude oil had no reason to go down. Stock market was reaching new highs and oil price was enjoying the ride, which caused a temporary deviation between gold and oil price. As the most recent correction came over (Or should we call it Bear Market? ), the price of oil crashed alongside the stock market and price of gold has risen from the ashes – NATURAL MARKET BEHAVIOUR. In meantime the stock market bottomed (Did it really bottom or we need a re-test?) and consequently rallied. The oil rallied with the stock market, however, the gold is still holding its levels. This is time when these two commodities are re-joining their relationship. Therefore, based on the above theory, it is rather likely the gold will continue moving upwards. Unless the crude oil would go down as a result of bear market. But then, if that is the case, where do you think investors will pump their money as a part of hedging and escape to safe heaven? Discussion continues below..
A growing uncertainties in several economic factors have negative impact on dollar. The number do not need to be very bad – the fact is that the numbers of unemployment are so fabulous at the moment, that a little increase can be perceived as negative news. It is no secret that the economy is peaking this year. For investors, the slowing economy in USA means a weaker dollar, which is a reason of increasing price of gold. Of course this inverse correlation is not perfect and some other macroeconomic elements may cause both to rise or fall in a same time in some cases. However, in long-term the inverse correlation is significant enough. Above is a six year long story of Gold and US Dollar. As you can see the relationship is obvious. However, between October and December 2018 both were rising until Christmas, when dollar started to wobble while gold kept holding its close to resistance levels. Therefore, it is logically expected that dollar is decreasing now. At the first sight it does not look so, and thus, we need to prove it comparing to the other currencies. One of them – the most watched one – is Japanese Yen. 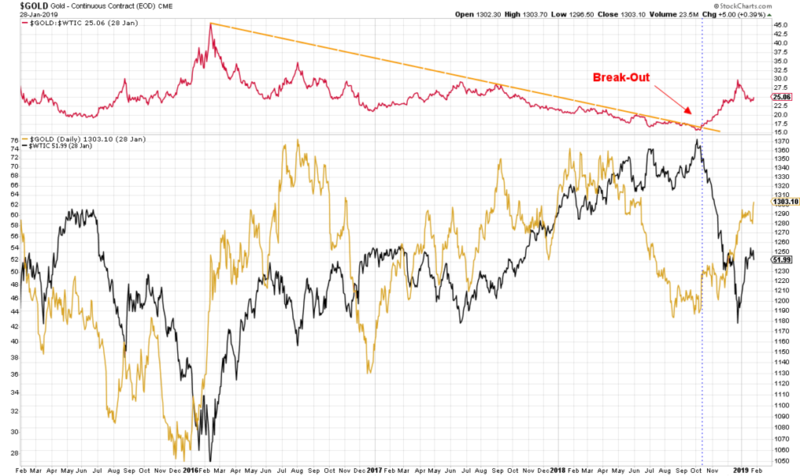 USD and JPY Ratio was rising during the whole year until it failed to pierce through the resistance. Contrariwise, the ratio dropped below its trendy support line and now, after a little rally it looks overbought again. The 2019 view on dollar is rather bearish and the view on gold is bullish and thus, the green and yellow lines on the chart will continue their paths while looking forward to meet each other. When there is an inflation lurking on the market the investors tend to hedge against it using gold. However, it isn’t that simple and does not work all the time. When inflation rises, FED must keep up with rates hikes and then, why would you buy gold if you can hold bonds and get paid even periodically in cash. But, what if inflation runs out of control? Now we talk about real interest rates ( interest rates minus inflation ) and this is when gold benefits prominently. Such scenarios do not happen very often, so what makes us think that this will be the time? The inflation is rising if you want it or not. That is a reality. FED would need to increase the rates more than 2 times. Jerome said it is going to be two times this year and thus, more than that will cause panic on the stock market and therefore escape to safe heaven – gold. Thus, FED will stick with only 2 hikes, but, then we have inflation out of control and the theory around gold and real interest rates applies and hence, gold goes up. By the way, the real interest rates are 0.96% now – buying bonds does not make much sense these days. I do not want to go into politics, but just imagine if Jerome goes against Trump with rates increases in such scale. Last time the rates were increased, Trump was already boiling. If Powell would increase rates 4 times instead of 2, Trump would close not only US Government, he would go to close government of intergalactic republics in Tatooine, Alderaan, Hoth, Bespin, and all the others.. In whatever way you try to think about the possible macroeconomic outlines, it mostly goes in favor of gold. MACD – line about to cross the signal line, while histogram approaching positive territory. Slow Stochastics – not oversold at all. The stock market is not very convincing. The long-term trend is still bearish even though we are experiencing a rally from the recent correction. The market cycle is reaching its peak and thus, some things are going to change. Investors need re-balance their portfolios and hedge against some downturns. The great hedge these days is gold and gold miners.